The Lacemaker is a painting by the Dutch artist Johannes Vermeer (1632-1675), completed between 1669–1670 and held in the Louvre, Paris. The work shows a young woman dressed in a yellow shawl bent in concentration as she sews the threads of a dress. At 24.5 cm x 21 cm (9.6 in x 8.3 in), the work is the smallest of Vermeer's paintings, however in many ways it is one of his most abstract and unusual. The girl is set against a blank wall, likely because the artist sought to eliminate any external distractions from the central image. As with his The Astronomer (1668) and The Geographer (1669), it is obvious that the artist undertook careful study before he executed the work; the art of lacemaking is portrayed closely and accurately. 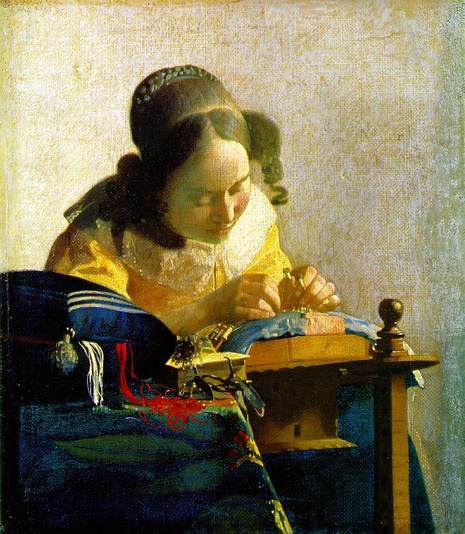 Vermeer likely used a camera obscura while composing the work; many optical effects typical of photography can be seen, in particular the blurring of the foreground. By rendering areas of the canvas as out-of-focus, Vermeer is able to suggest depth of field in a manner unusual of Dutch Baroque painting of the era.